I will be away from the office on a leave beginning March 11 through April 17. If you have questions regarding the transfer of materials to the archives or need assistance answering a question about the history of the Academic Health Center, please contact my colleagues at the University of Minnesota Archives. The recent addition of the text from the 2009 State of the AHC address to the digital archives brought the official tally of available digital pages to just over 25,000. While this is a significant milestone, it is just the beginning. There are an additional 20,000 plus digital pages waiting to be uploaded and indexed. For a little insight into the 3-step process, below are videos demonstrating the high-speed scanning process, the digital imaging of each page and the conversion of the digital images into full-text PDF documents available for viewing and downloading. The first meeting of the Board of Governors of the University of Minnesota Hospitals and Clinics was called to order at 1:35 pm by Chairman Atwood in Room 555 Diehl Hall. The Chairman then introduced Mr. Lauris Krenik, Chairman, Board of Regents Health Sciences Committee. 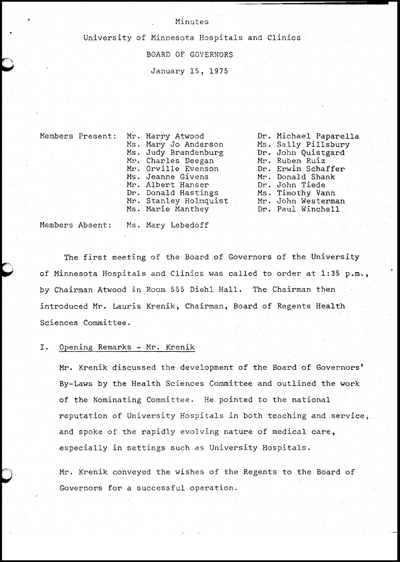 And so began the first recorded meeting of the Board of Governors, a governing board for the U of M Hospitals and Clinics established by the Board of Regents in order to act as the fiscal agent for UMHC and satisfy the requirements of the Joint Commission on Hospital Accreditation for University-owned teaching hospitals. The acquisition of the Board of Governor records came from two separate locations. First, a filing cabinet in the basement of Children’s Rehabilitation Center held 26 3-ring binders that contained the minutes of most meetings. The second acquisition was from several filing cabinets in a storage room in 555 Diehl Hall, the former meeting place of the Board. This second cache of records had additional meeting minutes, board correspondence and reports. My thanks go to Maureen Lally of AHC Communications and Elaine Challacombe of the Wangensteen Historical Library for bringing these two locations to my attention. These two separate acquisitions have been processed into a single collection and are available for use at the University of Minnesota Archives. Additionally, the minutes of all Board meetings plus a few additional reports have been digitized and are now available online through the University Digital Conservancy. The material in the digital archives represents twenty years worth of recorded documentation and consists of over 17,500 pages of paper records converted to digital format. Read through the first year’s minutes below or search for related material in the digital archives.